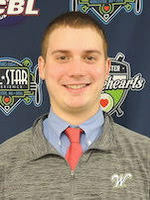 Drew Goldstein joins the Bravehearts full-time after interning during the 2017 season in the press box and 2018 season as the Operations Supervisor. Drew graduated from UMass Amherst this May with a Bachelor’s Degree in Sport Management. During his time in Amherst, Drew was an intern in the Media Relations Department for UMass Athletics. Just like the Bravehearts, Drew was born and raised in the city of Worcester, where he still resides today. Drew’s goal is to ensure that everything we promise to our players, fans, and corporate partnerships is delivered and executed to perfection on game-day and throughout the entire season.